Were you all able to survive through Monday? 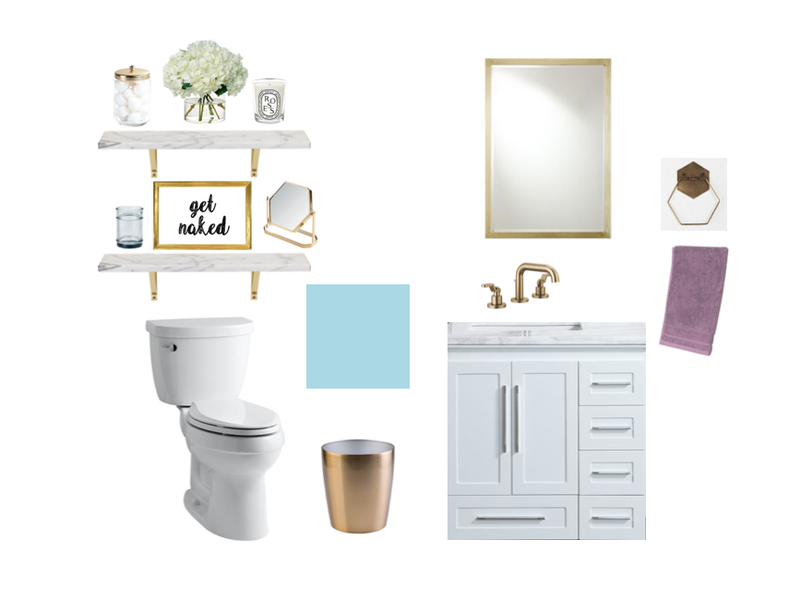 For today's post I am going to go over the first concept design for our Master Bathroom. The walls are painted the same light blue as our Master Bedroom so the two rooms flow into each other. Our bathroom is on the smaller side and the lighter color will help make the room feel more open. Since we don't have a lot of storage space in our bathroom I chose a vanity with a lot of drawers. It will give us more options for storage and hopefully help us stay more organized compared to our current open space under the sink. The countertop is marble with gray tones to stay within our cool color scheme. The hardware, such as the faucet, trash can, mirror and towel bar are gold to add in some warmth. To reflect the Master Bedrooms colors we have deep purple towels to add in a pop of color. As I mentioned previously, we do not have a lot of space in the bathroom so I thought adding in a few shelves over the toilet would be perfect for some extra room. I found some marble shelves with gold brackets that matched perfectly. The shelves are great for adding in decoration and are another option for storage. We store our Q-Tips and cotton balls in little jars that fit right on the shelves. I love how the bathroom fits in with the sophisticated and romantic feel of our Master Bedroom.